If you’ve got a gameroom, then it is undoubtedly filled with a coin-op game of some kind. Sure, now that its in your gameroom, you have the ability to put it on freeplay, but back in the day, you had to shove quarter after quarter into those things. If you’re like me, you probably got your quarters from a Rowe “Big Brown” BC-35. Perhaps you even have one in your gameroom RIGHT NOW! 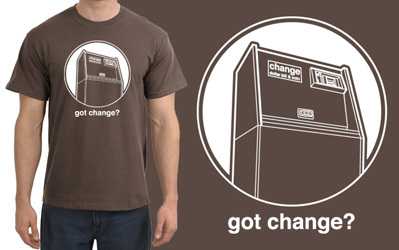 Anyway, this great “Got Change?” T-shirt from Chomping Quarters let’s everyone know that you’re always in search of the lifeblood of coin-op gaming, and you mean business! Pick up one (or 27, who’s counting?!) of these preshrunk, 100% cotton tees today!